In other countries civilian drone populations are already booming. 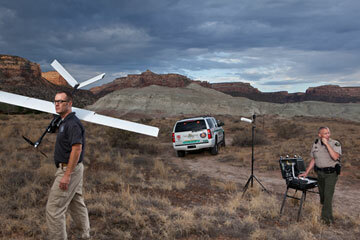 Aerial video is a major application. A U.K. company called Skypower makes the eight-rotored Cinipro drone, which can carry a cinema-quality movie camera. In Costa Rica they're used to study volcanoes. In Japan drones dust crops and track schools of tuna; emergency workers used one to survey the damage at Fukushima. A nature preserve in Kenya ran a crowdsourced fundraising drive to buy drones to watch over the last few northern white rhinos. Ironically, while the U.S. has been the leader in sending drones overseas, it's lagging behind when it comes to deploying them on its own turf. One issue slowing the integration of drones into everyday American life is that they crash a lot. Predators, while they appear fearsome and otherworldly with their blind, bulbous, alien heads, run on relatively poky snowmobile engines, and they're surprisingly fragile. The news is full of expensive drones falling out of the sky. Last June a massive Global Hawk, with a 116-ft. wingspan and a $233 million price tag, crashed in a marsh near Salisbury, Md., during a training flight. In December a Reaper crashed in the Nevada desert. The Washington Post reported on a run of drone crashes at civilian airports overseas, including two in the past year at an airport in the Seychelles, where Reapers were being used to keep an eye out for Somali pirates. Taken together, the Global Hawk, the Predator and the Reaper are the most accident-prone aircraft in the Air Force fleet, according to a Bloomberg report. You don't get the sense that drones are solid citizens of the airways yet, ready to share lanes with passenger jets. In fact, in September the Government Accountability Office (GAO) issued a report on drones that expressed serious concerns about, among other things, their unreliable performance, their lack of sense-and-avoid technology that would help them keep from colliding with other aircraft and their lousy electronic security. Last year a professor at the University of Texas demonstrated that it was possible to remotely hack into and take over a Homeland Security drone in midflight. The GAO report also mentioned "privacy concerns over the collection and use of UAS-acquired data." A lot of people share those concerns. Drones are the most powerful surveillance tool ever devised, on- or offline. A Reaper drone equipped with the Air Force's appropriately named Gorgon Stare sensor package, for example, can surveil an area 2½ miles across from 12 angles at once. Its field of view swallows entire cities. The Pentagon's Defense Advanced Research Projects Agency (DARPA) has produced an imaging system called ARGUS that can pick out an object 6 in. long from 20,000 ft. in the air. In a story worthy of the Onion, USA Today reported in December that Air Force officials were so swamped with the 327,384 hours of drone footage taken last year, they consulted with ESPN about how to edit it down to the highlights, à la SportsCenter. Imagine how Americans would feel if the Gorgon Stared at them. It's not a hypothetical. In June 2011 a county sheriff in North Dakota was trying to track down three men, possibly carrying guns, in connection with some missing cows. He had a lot of ground to cover, so  as one does  he called in a Predator drone from a local Air Force base. It not only spotted the men but could see that they were in fact unarmed. It was the first time a Predator had been involved in the arrest of U.S. citizens. Exactly how often Predators have been seconded to local law-enforcement agencies in this manner isn't known; that information is the object of a pending Freedom of Information Act request by the Electronic Frontier Foundation. But there's at least one Reaper equipped with Gorgon Stare at large in the U.S. Legislators from both parties, in North Dakota and elsewhere, are scrambling to throw legal restraints around the domestic use of drones. In Virginia, the relevant bill is supported by both the ACLU and the Virginia Federation of Tea Party Patriots. Until actual legislation is passed, it won't be completely clear what information the government can and cannot gather using drones. There are certainly precedents: the Supreme Court has ruled that the police can, under the Fourth Amendment, fly an airplane over your fenced backyard and check out whether you're growing pot back there. It's not a giant leap to imagine them flying a drone instead. But where does it stop? The framers didn't anticipate technology that could hover for days, keeping an eye on exposed backyards and porches, that could work in networked swarms, see through walls with thermal imaging, recognize faces and gaits and track license plates. "If we have a bad guy named Waldo," Singer says, "and we have to find Waldo somewhere in that city, we will naturally gather information about all the people around Waldo, not out of malice but just because that's the way it is. What happens to that information? Who owns it? Who stores it? Who shares it? Big questions."